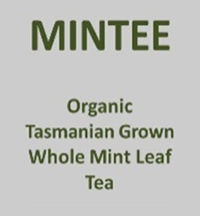 Premium Australian Grown Green tea, Tasmanian Kelp, Wakame & Organic Mint Leaves. The Kool Company came up with the idea of using the benefits of Kelp in a tea by blending it with Australian Grown Green Tea to create a light refreshing beverage for people to gain the health benefits both Kelp and Green Tea have to offer. 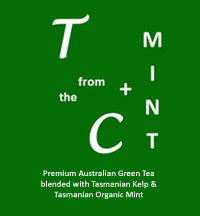 The Kool Company selected an Australian Grown Premium Green Tea and Kelp from the pristine waters of Tasmania to create T from the C. Another variety was created to add Organic Tasmanian grown Mint, T from the C+MINT. Green Tea is considered to be one of the highest sources of antioxidants and combined with Kelp’s nutrients from the sea, makes a light, well balanced and refreshing healthy beverage. Green Tea holds Polyphenols referred to as Catechins known to be powerful antioxidants to destroy free radicals in the body. Cetechins are the main astringency component of Green Tea, long known as tannins. The Catechin content of young shoots (first or second pick) is higher than mature leaves (third or fourth pick) and THE KOOL COMPANY uses first or second pick. It is claimed Green Tea assists in weight loss by assisting your metabolism and it regulates Glucose levels. Green Tea consumption is also associated with a lower risk of heart disease and stroke, strengthening Blood Vessels, lowers Cholesterol, protects Brain cells and Catechins are also claimed to be Anti-Viral and Bacterial which also assist with Oral health. Green Tea also contains Theanine, an Amino Acid known to provide a tranquilizing and relaxing effect. Green tea is known for having more vitamins and minerals in higher concentrations than other foods, and this fact alone makes Green Tea a superior beverage with vitamin B2, C & E as well as Minerals (Potassium, Calcium, Phosphorus, Manganese) β-carotene & Chlorophyll. The dried Kelp (Durvillea potatorum); comes from the West Coast of Tasmania where this unique species of Bull Kelp thrives in the mixing zone of nutrients welling up from the depths of the Great Southern Ocean. Due to cold sea temperatures, it has the highest alginic acid content and natural growth stimulants, vitamins and minerals of any brown kelp in the world. As Kelp absorbs its nutrients from the ocean it will also absorb pollutants from the ocean thus the importance of a clean and pristine environment such as Tasmania. Dried Kelp contains extraordinary amounts of minerals, some of the most common include cobalt, nickel, boron, manganese, fluoride, molybdenum, selenium, copper, zinc, iron, iodine, phosphorous, sulphur, chlorine, potassium, magnesium, calcium, sodium and high quantities of iodine as compared to the minimum required in our diets that it’s primarily known for this particular nutrient. Dried seaweed is rich in iodine and magnesium. Iodine is essential for human life, without it, your body cannot synthesize thyroid hormones which regulate your metabolism and play a role in many body functions. Magnesium keeps your heart healthy, your muscles and blood vessels strong and helps break down carbohydrates for energy use. As the land plants produce very low levels of iodine, it’s recommended to have dried Kelp to increase the iodine content in the body. Kelp is also rich in Protein, Vitamins K, C A and Folate. Kelp contains lignan phytonutrients which are nutrients found in plants. Beta-carotene is a natural pigment in dried Kelp. Beta-carotene has antioxidant properties and works to protect you from ultraviolet damage. Mint is known to be an antioxidant containing vitamins, minerals and is rich in essential oils and can aide digestion. Peppermint-herb is an excellent source of potassium, calcium, iron, manganese and magnesium. 100 g fresh herb provides 569 mg of potassium. Manganese and copper works as co-factors for the antioxidant enzyme, superoxide-dismutase. Vitamin A, beta carotene, vitamin-C and vitamin E. The leaves of mint also contain many important B-complex vitamins like folates, riboflavin and pyridoxine (vitamin B-6); and the herb is an excellent source of vitamin-K. Allow the water to cool to 70°- 75° then pour over your leaves and steep 60-90 seconds. The common error is steeping the leaves too long at 100° creating a bitter taste. 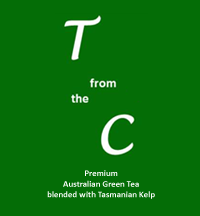 Premium Australian grown Sencha full leaf Green Tea blended with Tasmanian Kelp. Premium Australian grown Sencha full leaf Green Tea blended with Tasmanian Kelp & Organic Tasmanian Mint leaves. 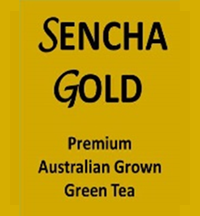 Premium Australian grown Sencha full leaf Green Tea. 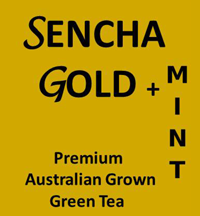 Premium Australian grown Sencha full leaf Green Tea & Organic Tasmanian Mint leaves. Organic Tasmanian Grown Whole Mint Leaf Tea.